A constant problem I have is trying to find a secure mounting solution that is flexible enough for me to upgrade or swap out my devices. I have a number of devices that I use on a pretty permanent basis so I really do need have mounts that can be swapped out easily. 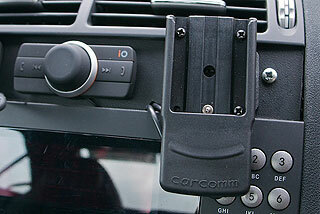 Well at long last CarComm have designed the perfect solution the Multi Basys interchangeable device mounts. The concept is pretty simple: Take a dock mount with a common connector, then design device specific holders that mate with the dock - "Simples". I have had my mounts for a few weeks now and have put them to the test with over 1500 miles on the clock. 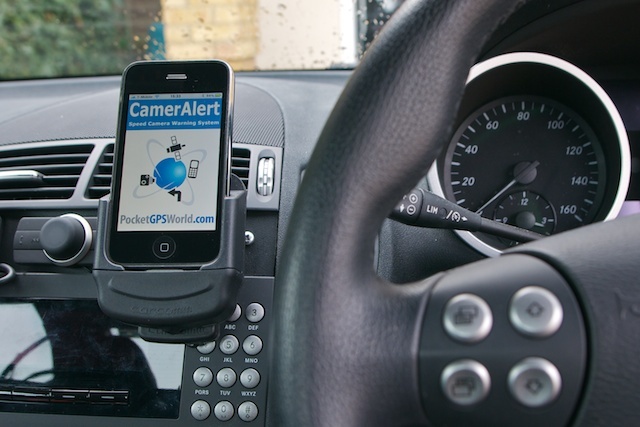 The mounts were provided by CarComm International BV The dock costs �24 and the device specific holder �44 and are available from CarComm dealers including TotalPDA in the UK and KUDA in the US. 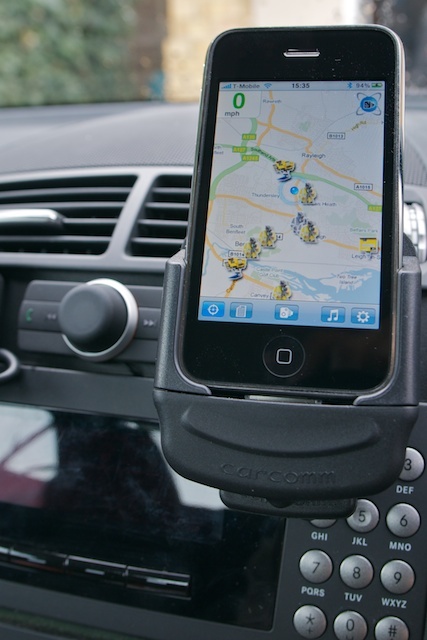 Read on to find out how easy it was to install and use the CarComm Multi Basys mount system. As mentioned above the system consists two parts: the dock mount and the device holder. The doc mount comes in 2 different options: hardwired or cigarette lighter adapter. I selected the hard wired option, though in retrospect the cigarette lighter would have been the better option. The dock mount has two cables: a power cable and an antenna cable. Mine also came with an inline fuse, something essential to protect both the device and car. 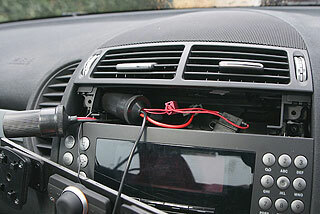 The power cable is simply terminated in soldered red/black wires for direct connection into the car. The system is able to handle either 12v or 24v from a car or truck. The antenna cable has a standard screw connector which couples to the external aerial. There are a large number of device specific holders available for this system. Far too many to list here. I have checked a number of the most popular SmartPhones and they are all covered. The full list can be found here. Currently the holders are only available for SmartPhones and phones, there are no holders available for PNDs. 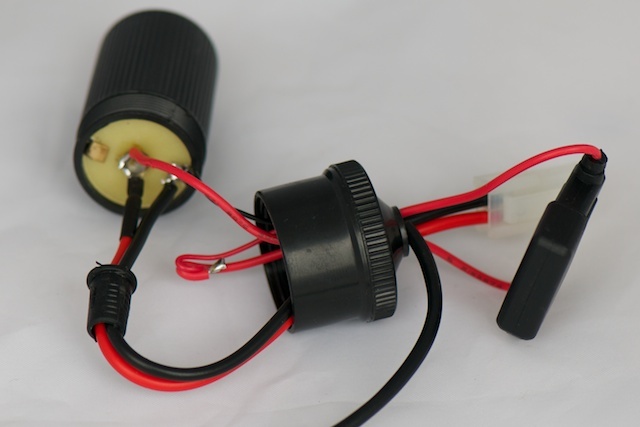 The holder contains the circuitry to convert the input voltage (12/24V) to that required for the specific device. Of course it also holds the device safely and securely whilst you are driving. The holder is constructed from black plastic with a textured matt finish. The rear of the holder has a mounting plate and common connector to mate with the dock mount and pass the power and antenna connections through. 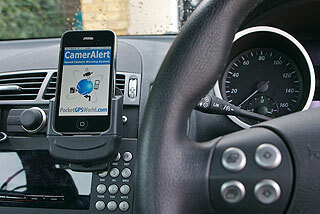 To allow the unit to move I also used a tilt/swivel adapter to go between the dock and the car dash. This does not allow much movement, but does let me twist the device to optimal viewing positions. The tilt/swivel connects to the dock using and industry standard 4 screw pattern. This in turn can be affixed to a vehicle mounting plate. In my case I have specially adapted my dash to allow direct fitting of the tilt/swivel and mount. A short time ago I had an ioPlay hands free system fitted to my car, and made sure that I had it prewired for my intended mount modifications. Tucked behind my mounting panel I have 2 cigarette lighter sockets fitted. For the CarComm adapter this turned out to be a slight problem as the CarComm has bare wires. Not a real problem for me, out came the soldering iron and within a few minutes the cables were connected and insulated. Not trusting my handiwork I did a quick test of the mount to ensure that the wiring was correct and the devices received power correctly. Of course they did, but knowing my luck I would have put everything back and screwed all the components together only to find I had missed something. Better to be safe than sorry. With the wiring sorted I replaced the panel and went about fitting the swivel base. Again this only took a few seconds after which 4 nuts and bolts secured the dock mount and I pushed the excess cable back behind the panel. And that was that, the mount was in place. All I needed to do now was slip the iPhone holder into the dock mount and away I went. 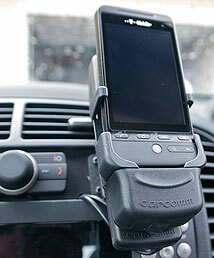 Now when I want to test something on my HTC Hero I just slip the iPhone holder out and slip the HTC one in. 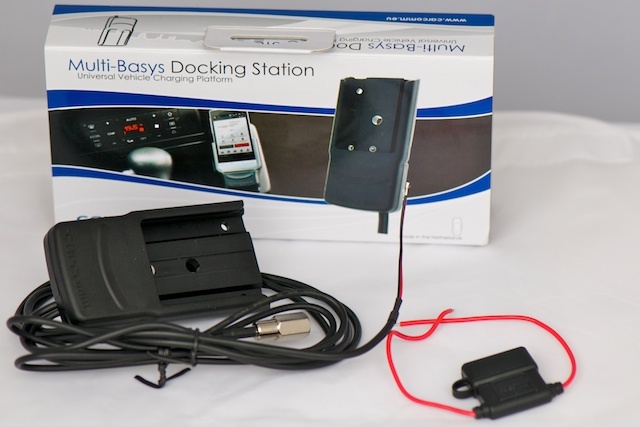 In addition to the Multi Basys system you may also require a vehicle specific mounting plate which will provide the correct platform for your car to attach the holder to. Firstly with my iPhone the speaker at the bottom of the iPhone fits into the holder and the sound is muffled. This is not normally a problem for me as I tend to connect the iPhone through the ioPlay and have all the audio routed through that. The speaker for the HTC Hero is located in a different place and as such my Android phone did not suffer from muffled sounds. Despite the fact that the microphone is located on the bottom of the phone my voice is still heard clearly by the other party. Secondly, again with the iPhone, the GPS receiver on some iPhones is not the best in the world. 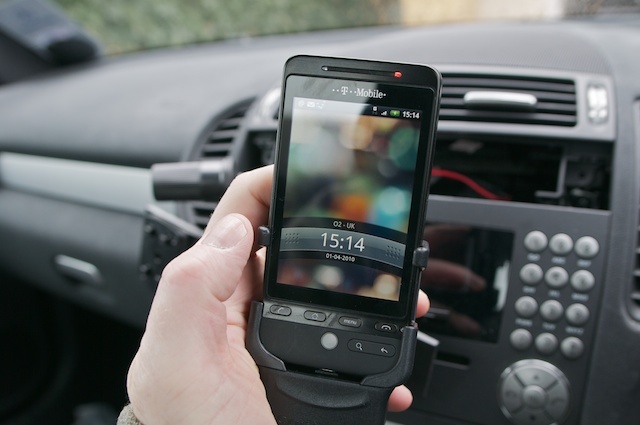 Some devices work much better with a GPS holder. 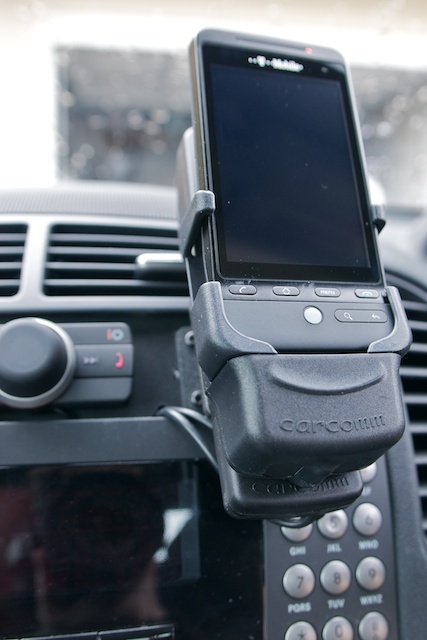 The CarComm Multi Basys does not provide GPS data. This is not a problem with the Multi Basys, but the iPhone. Thirdly some users may want to have the audio hardwired from the mount into an amplifier this can only be done using an external cable from the headphone socket to the input of the car's stereo. Again this is not a major issue. 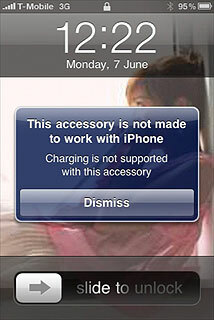 Fourthly when I docked my iPhone with the ignition off I often got the message: "This accessory is not made to work with iPhone. Charging is not supported with this accessory". Selecting "Dismiss" and then turning the car on cures this issue. Charging is indeed supported, as can be seen by the lightning bolt in the battery icon in the iPhone display above. The docking system also has an advantage when security is concerned. Although the system is hardwired when the holder is removed the dock mount is left. This is not obviously a phone or device holder so any potential thief is likely to overlook this. Of course as the holder is for your phone you would most likely take it with you anyway. When I want to use my HTC Hero I simply swap the holders and hey presto I now have a powered mount for my Hero. If you have a number of different phones that you use, or are continually changing or upgrading your phone but not your car then the CarComm Multi Basys mount solution could be for you. 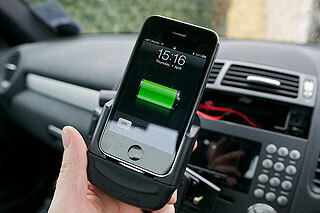 Change your phone - Change the holder, no messing around rewiring the car. It allows you to have your phone within easy reach to answer calls. With the power and external antenna connections your phone will always be available with optimal wireless signal. It seems to support many smartphones and PDAs, but no dedicated satnavs.